God can, must, and will bless; and upon this blessing everything depends. 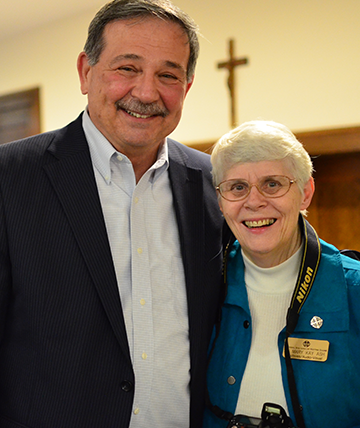 Your gift will make a difference by supporting the School Sisters of Notre Dame in ministry and retirement. With your financial support, sisters are able to serve in areas of greatest need. Your generosity provides for the needs of sisters who dedicate their lives to serving youth, women and the poor. Blessed Theresa of Jesus Gerhardinger founded the School Sisters of Notre Dame to meet educational needs over 185 years ago. Today, sisters in the Central Pacific Province serve as educators, advocates for the poor, protectors of the earth, voices against human trafficking and in a wide variety of other educational, spiritual and social justice roles. SSNDs continue to choose ways of living and serving that call our modern, complex world to the good news of Jesus Christ. Your generosity allows SSND to continue to make a difference, so please consider making a gift today or learn about other ways to make a gift. To learn more about School Sisters of Notre Dame ministries and learn why your gift is important, please sign up for our monthly eNewsletter. Additionally, you can read past issues of our donor newsletter. You can also learn more about our ministries. Retirement Needs: Your gift to SSND’s retirement needs assists in providing quality care for senior sisters. Our retired sisters continue to serve through their prayer and presence, and they welcome your prayer requests. Undercompensated Ministries: Your gift in support of SSND provides supplemental financial support for those who served and who are still serving in undercompensated ministries. Undercompensated ministries refers to the many years of working in ministries, where sisters received a small stipend as payment. SSND is working to care for the now-retired sisters who were undercompensated. Justice, Peace and Integrity of Creation: Your gift allows SSND to focus on important social justice issues in an effort to answer urgent needs, advocate for peace and nonviolence, and promote responsible care for creation. 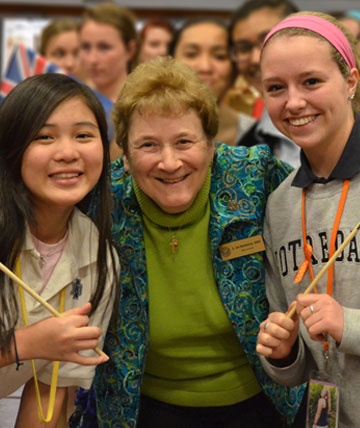 The School Sisters of Notre Dame strive to create a global community where human dignity is respected, all creation is treasured, spirituality is nourished and justice is accomplished as part of the mission to show God’s love to the world. This commitment is reflected in the work of Shalom – Justice, Peace & Integrity of Creation. Shalom is the Hebrew word for peace. Shalom is also the word School Sisters of Notre Dame use to describe their international network for justice, peace and integrity of creation. More than 2,500 sisters, associates and friends of SSND across five continents make up the Shalom Network. Learn more about Justice, Peace and Integrity of Creation. Sponsored, co-sponsored and affiliated ministries: Your gift to sponsored, co-sponsored and affiliated ministries provides the financial support for sisters working to empower individuals to reach the fullness of their potential. These areas of service include: formal education, education centers, and tutoring, transitional housing and outreach services. These ministries began in response to an urgent need and are supported through a variety of resources. SSND currently supports 21 ministries focused on transforming the world through education. Learn more about sponsored, co-sponsored and affiliated ministries. 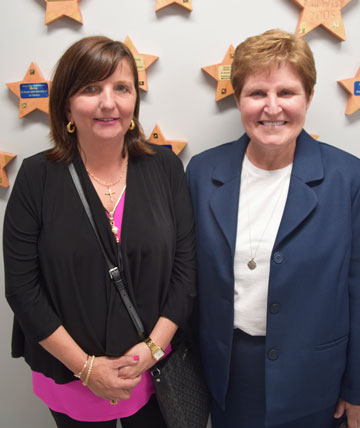 Learn why donors support the School Sisters of Notre Dame and how they got involved. Having an estate plan can protect your assets and secure your interests now and in the future.